Talking about animals in Spanish introduces children to a lot of language. Learning about animals, children hear common Spanish verbs, descriptive words and vocabulary for the natural world. Of course, kids love animals, so they also enjoy activities and books related to them. 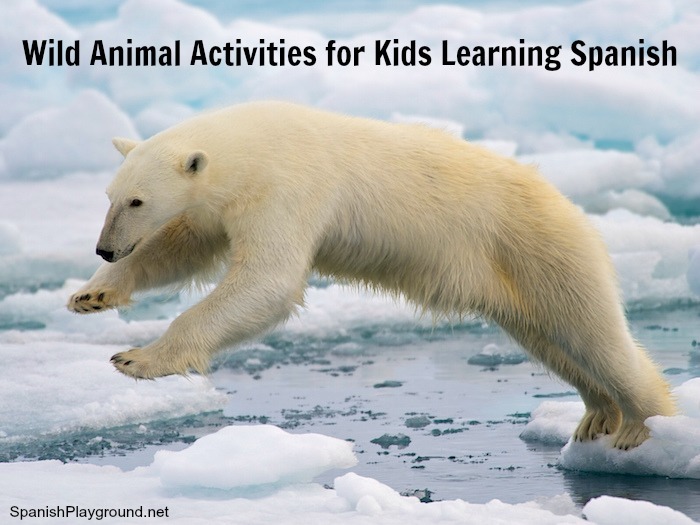 Try these ideas for teaching children language related to wild animals in Spanish. These suggestions are part of the Easy Spanish-Easy Yoga series. You can find more information about the series at the end of the post. There are lots of songs in Spanish about wild animals and going to the zoo. Some are based on English songs that kids may already know. Here are a couple that work well with children learning Spanish. El baile de los animales only mentions three animals (cocodrilo, elefante, pollito), but it is fun for little ones. There is lots of repetition as kids move like the animals, but with variations. Yoga in Spanish is fun, active language learning. Yoga poses are associated with animals and actions, so kids are acting out animal words in Spanish. Kids Yoga Stories has a post on animal yoga. There is focus yoga flow with three poses that represent these animals: sheep dog – perro ovejero, lion – león, turtle – tortuga. See the post on Kids Yoga Stories for how to do the poses. As you flow through the poses, say the words in Spanish. Kids Yoga Stories also has wonderful wild animal picture book in Spanish. Buenas noches mundo animal is a story with yoga poses woven into the narrative. Children do the poses as they listen to the story. This is a great book to read aloud with if you are talking about animals in Spanish! 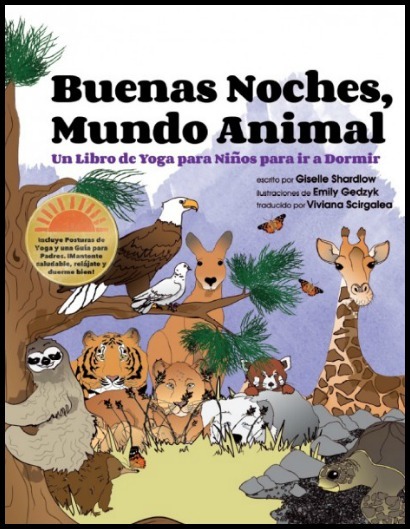 Buenas noches Mundo Animal is available on Amazon and on the Kids Yoga Stories website. Crafts are always a hit with kids. They provide lots of opportunity to talk and use words for wild animals in Spanish.There are thousands of animal crafts online for all ages. One of my favorites for little ones are these wild animal pet rocks from U Create. There is a free printable to make a monkey, a zebra, an elephant and a lion. You can talk about the animals in Spanish and also body parts and colors. They are easy to make and really cute! Picture cards are great for games of all kinds, from memory to hiding games. You can find a set of color picture cards from Educapeques with wild animals in Spanish. I also made a set of black and white animal picture cards that I use for lots of activities. There are digital publications about animals in Spanish on Issuu. This one, Los animales salvajes, has photos with the animal names first and then sentences that describe the photos. There are also previews from publishing houses, like this book from Bamboo called Un sonido ¡Animal! Often a preview like this is enough for Spanish learners. This one has activities in the back. In this Facebook album look for the photos labeled Animal del día and Dato curioso. The captions have a sentence with information about the photos. They are great for Spanish learners! 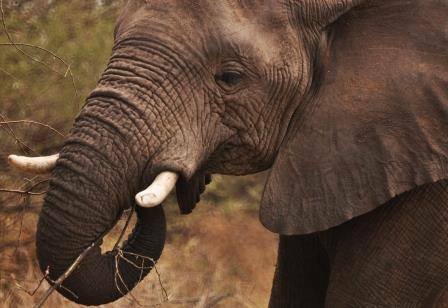 Dato curioso: la trompa de un elefante no tiene huesos, pero tiene 40,000 músculos. I hope this post with ideas for talking about animals in Spanish proves useful! At Spanish Playground, we are working with Kids Yoga Stories to create activities to teach children Spanish and yoga through basic concepts. In a series of monthly posts, we give you simple activities that you can work into a busy schedule. In addition to yoga, you will find other language activities you can do with Spanish learners related to the theme of the month. I have learned so much from the way you structure your units. They are always so well thought out and complete. Keep up the great work. Gracias.